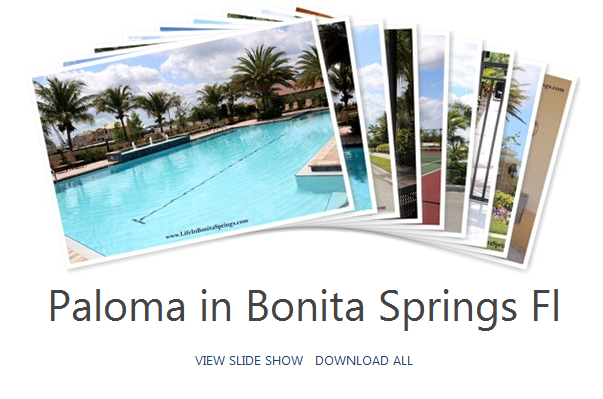 Paloma is one of the newer communities situated between I-75 and Imperial/Three Oaks Parkway in Bonita Springs, Florida. The appeal of this community is it’s modest, low fees and amenities which include resort style community pool, clubhouse with catering kitchen, fitness center, bocce court and tennis courts.There is no dining and country club within the community. Built by D.R. Horton, the homes at Paloma feature modern floor plans and design appointments. There are single family homes and attached villas located south of the club at Paloma. A series of condominiums will be available north of the clubhouse. Views from homes include lake, landscaped area, privacy wall or wooded area. Since there is no golf at Paloma there are no golf course views. The community of Paloma is gated and has no CDD and offers fast access to Coconut Pointe, Bonita Beach and many other conveniences in Bonita Springs area. The community of Paloma was originally titled Monaco so there are some properties in Paloma which may reference that name in the legal description. Communities with homes similar to Paloma of Bonita Springs can be found in Hawthorne, Bonita Isles and Bonita Lakes. Paloma and DR Horton Homes has recently completed new construction of single family homes and villas leaving only resale properties available. To learn more contact Chris Griffith, 239-273-7430 call/text.